Hillary Clinton, Democratic Presidential Candidate, Is On A Road Trip To Iowa In A Van Nicknamed "Scooby"
In a two-minute video announcing her presidential candidacy, Hillary Clinton said she was "hitting the road" to start earning people's votes. 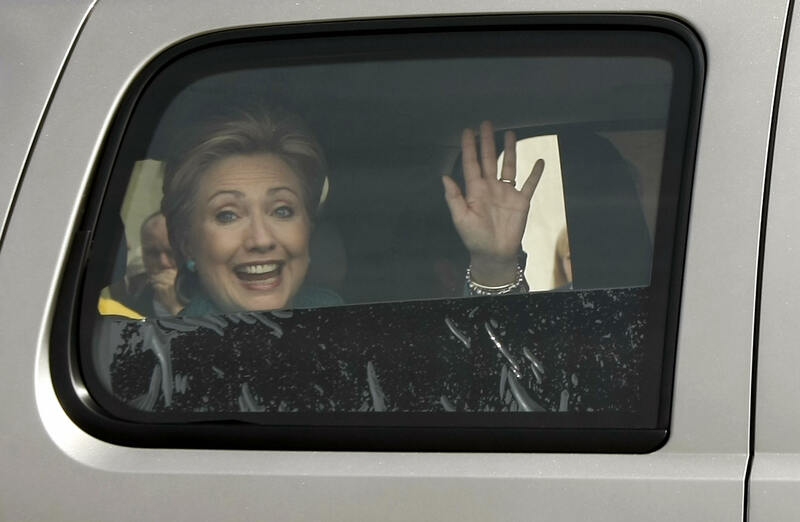 Turns out she meant that literally: Hillary Clinton is on a road trip to Iowa in a van she nicknamed "Scooby." She will arrive in eastern Iowa on Monday and will appear on Tuesday at a community college in Monticello for her first campaign event. On Sunday night, the former first lady and New York senator left from her house in Chappaqua, New York, and headed on a 1,000-mile road trip to Iowa, the first battleground for the country's presidential caucuses. Clinton's caravan stopped at a Pennsylvania gas station where she chatted with people, including a family from Michigan and 19-year-old Penn State Altoona student Chris Learn. He told CNN Clinton greeted him and asked questions to his surprise. I knew it was her immediately. I just saw her and I was like, there's no way that's her! Clinton's official Twitter account also shared a photo from the pit stop. In a tweet signed by Clinton, the photo is captioned, "Road trip! Loaded the van & set off for IA. Met a great family when we stopped this afternoon. Many more to come." Clinton reportedly dubbed the van "Scooby" after the Mystery Machine van in the popular American cartoon series The Scooby Doo Show. According to CNN, the former secretary of state is a passenger in the van that's being driven by Secret Service. The Associated Press reported longtime aide Huma Abedin said the road trip was also Clinton's idea. When Hillary first told us that she was ready to hit the road for Iowa, we literally looked at her and said, "Seriously?" And she said, "Seriously." This was her idea, and she's been really excited about it since she came up with it. The road trip is a major sign of what we can expect from Clinton's "everyday American" campaign, which, in the early months, will be centered around her strengths: small, intimate appearances where she can listen and try to help solve Americans' problems. Unlike in her 2008 bid, which critics said felt entitled and removed, Clinton is attempting to reintroduce herself as an approachable candidate running a millennial-friendly campaign. The "wife, mom, grandma," as stated in her Twitter bio, suggests Clinton will play up her potentially history-making run for the White House while highlighting her longtime role as a women's rights advocate.